A report in Broadcaster Magazine details Canada's Olympic Broadcast Media Consortium's planned coverage of the Vancouver 2010 Paralympics. It will be a full schedule of inspirational personal stories, 90 minutes of daily highlights, and every sledge hockey game, including live broadcast of the final. Thoralf Hognestad, says: "Due to a new work situation, I have resigned as coach of Team Norway." Thoralf joined the team after they narrowly lost to Canada in the semi-final at Torino, a game he feels Norway should have won. His team did win the World Championship in 2007 and 2008. Thoralf's teams were known for winning, not for statistical accomplishment. He selected athletes of proven ability in other sports and moulded them into repeat world champions. "We don't play the able-bodied game," he'd say. "We play the wheelchair game, and we always have a back-up plan." He put down the lack of success in 2009 to the lack of a local training facility for the entire season. "We just couldn't practice enough," he said, though Norway were still able to defeat Canada in a meaningful last round robin draw. He has struggled to balance coaching and work commitments for some time, and hands off to Denmark's Per Christensen. 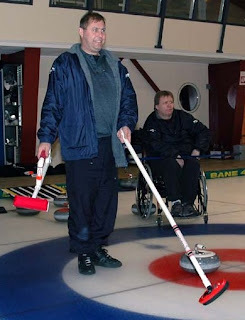 Per, 53, has been coach of the Danish national wheelchair curling team since 2004 and attended the 2009 Worlds as an observer. He shared my surprise that so few teams came into their games against Canada with a specific plan to win. "I would for sure, tell my team how to play the Canadian team. It was for me easy to see how it could be done," he told me, without divulging the details. In Team Norway he has curlers who have proved they know how to win. We'll see how good his plan is, and how well they implement it in Vancouver next March. 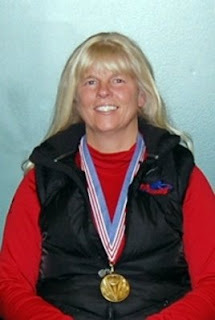 Parasport and Recreation PEI and the Canadian Paraplegic Assoc. are sponsoring a Give-It-A-Go session at the CARI Complex in Charlottetown PEI, 4-6pm on Tuesday June 16. For more information contact Cathleen MacKinnon at 902-3699-4540 or by email. Paul Thomson of the East Kilbride News reports: "It was a great night for Strathaven’s Aileen Neilson as she collected the prize for Adult Female Sports Personality of the Year. A South Lanarkshire Primary School teacher, she curls at the Lanarkshire club as well as in Braehead and was fully deserving of her accolade. "During the last year she represented Scotland and Great Britain in numerous international tournaments in Europe, America and Canada. 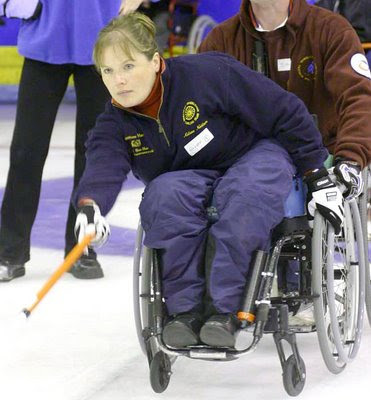 And it was in Canada where she competed at the highest wheelchair curling level, being selected to represent Great Britain at the World Championships in Vancouver where the team finished in fifth position. "From world achievement to national success, Aileen was also in the rink which won the Scottish Championships in Aberdeen."